Leave a Comment on Let them eat ice cream! The 17th century was a busy one. Full of territorial disputes around the world, English colonisation of the Americas, Japanese isolation, the fall of the Ming Dynasty in China… I could go on. But I won’t. More importantly, the world was (still) heavily focused on religious art, though many artists started to branch out and become a bit more narcissistic, here’s lookin’ at you Rembrandt and your many self-portraits. Do you know what else came to be in the 17th century? Ice cream. You (probably) read it here first! No proper recipe for ice cream, though various other versions previously existed in Persia, China, and Italy for example, appeared until 1674 in France. 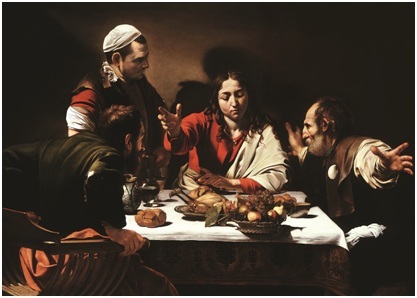 Michelangelo Merisi da Caravaggio, Supper at Emmaus, 1601. Oil and tempera on canvas, 141 x 196.2 cm. Are you thinking what I’m thinking? Surely the invention of ice cream stirred a deeper belief in God and Jesus Christ – who or what else could inspire such a cold, creamy, delicious treat? Could it be that artists of the time were so overjoyed with appreciation that they could find no other way to express their praise except to paint on the canvasses closest to the Heavens at the time: ceilings? 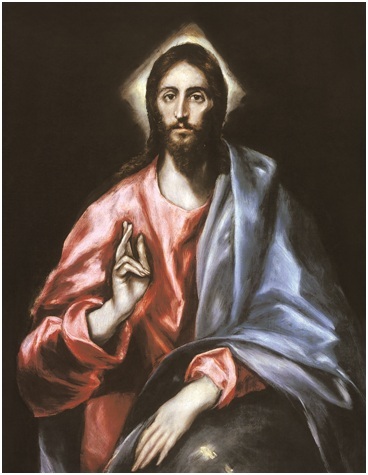 El Greco, The Saviour, 1610-1614. Oil on canvas, mounted on wood, 100.4 x 80.2 cm. The Musée Carnavalet is exhibiting The Colours of Heaven now through 24 February 2013, a collection of paintings, drawings, and engravings devoted to Paris’ many churches. Don’t worry; you won’t have to crane your neck to look upwards too much. And if you’d like to see more religious devotion, check out the beautifully illustrated ebook, Christ in Art by Ernest Renan.